Thank you sooo much for all your help! I really do appreciate it. But I need a name. I really do. You know how I have it listed in my folder? Donut Holes!" Yes, I do. I'm ashamed. A quilt like this should not be called Donut Holes. In the end I loved how this one turned out but I am pleading with you for help with a name! It's super easy - only one big block made 36 times! No sashing. No "on point". Nothing like that! I'll get the pattern put up on the site on Monday after I choose a name from hopefully, suggestions from you all. If you you have a suggestion for a name, please put it here in the comments, or skip over to the Facebook group - Quilted Twins - Scrap Quilting and more with Becky and post it there in the comments. I'll let it go through the weekend and decide on Monday. The block is shown to the left. Thanks for help! 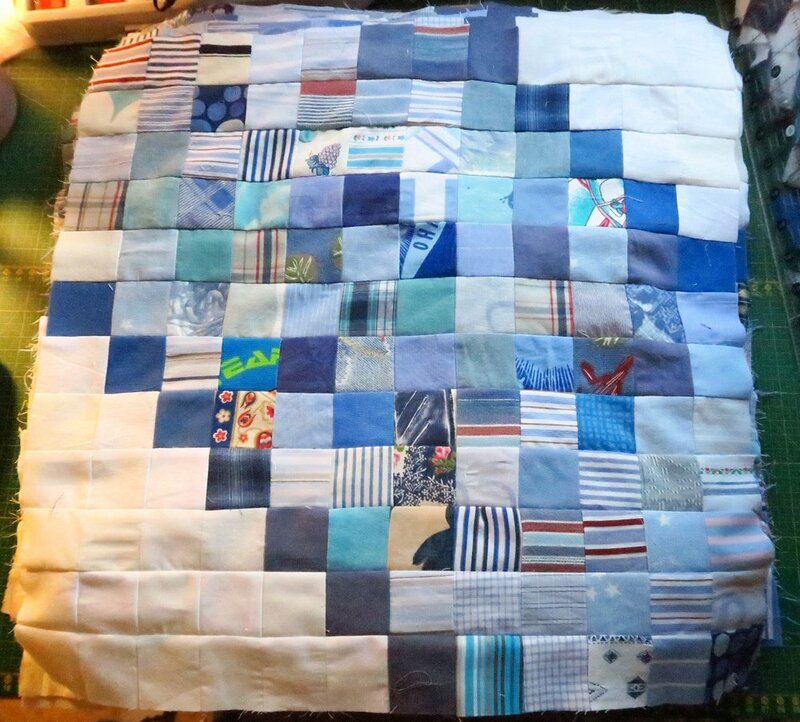 This quilt was truly another one that made a huge difference in the volume of scraps I have left. Aren't you amazed that I'm at quilt top number 32 from these blues? I know I am! I honestly thought I'd have about 10 in this series. I guess it goes to show how little I was connected to reality when it came to my upcycled blues! The design is easy - but effective. In a way, I suppose it's a double quadruple Irish chain :) - if that helps at all! And that's what's been happening from my part of the world with regards to quilting!